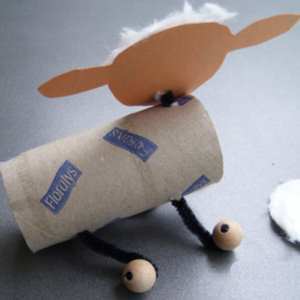 Make holes in the toilet paper roll for the legs and head. Pull pipe cleaners through the leg holes and attach wooden marbles to the end – gluing down. 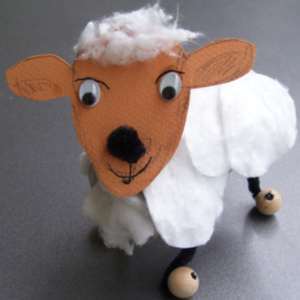 Trace a head onto craft card and cut out – make a hole for a pipe cleaner nose. Draw on a mouth and stick on wobbly eyes. Out of a piece of pipe cleaner make a sphere at one end and stick through the head as a nose, securing the other end to the toilet paper roll – glue into place. Stuff cotton wool into the ends of the roll, and stick cotton/ordinary wool onto the outside. Stick wool onto the head in the same way.